Bitonic, the company behind BL3P operates out of the Netherlands and more importantly is one of the leading companies in the world of cryptocurrencies there. They have gained a sold reputation after cooperating with the well-known entities in banking and academia. While Bitonic offers a lot of services, ranging from direct selling of Bitcoin, consulting others, offering a Bitcoin solution for online shops to BL3P – a real-time cryptocurrency exchange. After reviewing the trading conditions, which we will cover in details below, we can clearly say this is an exchange, targeting European traders. This is by no means a flaw, other than the fact not everybody can use it, which will in turn limit liquidity. BL3P has not experienced any massive hacks. This is not a guaranty of future safety, but a solid track record is always better than a spotty one. We didn’t manage to find many user reviews on BL3P, but given the fact they overcome the main flaw of the “parent company”, the situation is a bit more positive. Only one trading pair is supported at BL3P: Bitcoin vs the Euro. This makes the entire project seem less appealing to those who are willing to venture far beyond in the realm of altcoins. Then again they can always send a transfer to Bittrex or a similar exchange, if that is their desire. BL3P does not allow leveraged trading. This shouldn’t be much of an issue, given the volatile nature of cryptocurrencies, although some exchanges, like Bitfinex provide at least a small level of “gearing”. If you are willing to buy Bitcoin for making a payment or holding it for the long term, going through a cryptocurrency exchange is the only way. Then again, if you are only looking to trade in the short term, some forex brokes (such as easyMarkets) provide Bitcoin CFDs. These are purely speculative financial instruments, which only follow the price movement of the thing they are build upon. Check out our article, detailing the specifics, if this interest you. 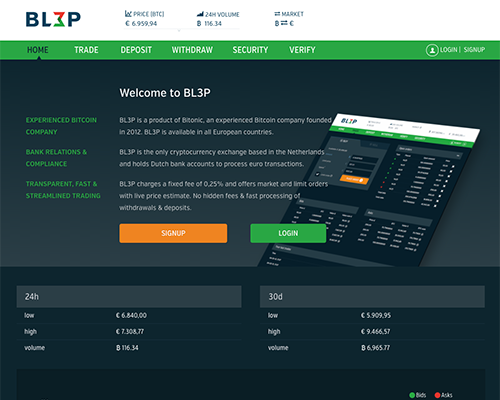 BL3P charges a flat fee of 0.25% + 0.01 EUR per filled order. This is in line with the curren offers by other exchanges. The latter part in done to disencourage trading algorithms, which constantly place orders, attempting to make gains from the shore spread. Manual traders may find this more enjoy than the most other trading venues where a constant dance between the best bid and ask occurs. That being said, bigger traders who frequently get partially executions may find this annoying. If one of your orders is marched for a portion of the volume, you will have to pay a fee of 0.01 EUR. Then if you decide to cancel or move the remaining order and it gets filled, you will have to pay an additional euro cent. This may not seem like a lot, but it can add up for active traders. BL3P provides an unusual web-based platform. First of all the charting is very basic and most interestingly located in the top portion of the website. Inexperienced traders may not realize where they have to click in order to see it. This is non-satisfactory for many reasons. While we may not be the most honest judges, as we are used to dealing with forex trading platforms, such as MetaTrader4 (MT4), even people who are not that experienced will probably not like this solution. In order to register on the website, you will have to verify your account with a few pieces of information. To prevent money laundering and apply KYC under Dutch WWFT law, bl3p.eu will request proof of identification, proof of residence, and photo of debit card, bank statement, or screenshot of online banking.